Colorized version of the spanking scene in Silen. Silen is an illustrated German poem (a picture story) by Wilhelm Busch, originally published in Die Haarbeutel in 1878. Busch was 46 when he drew this. The story is metaphoric and narrates an encounter of two characters from Greek/Roman mythology: Silen, a corpulent Dionysus-like figure, and Amor (Eros, Cupid), the god of love, a young naked boy with wings. 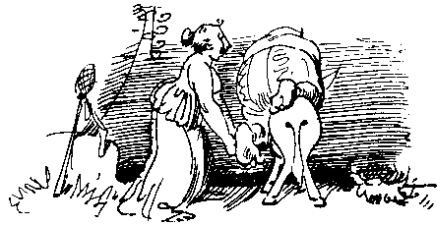 Silen is Busch's take at the classic motif of Punished Cupid. The work is set in metric, unrhyming verse. The meter is a elegiac distich; the first line of each pair is a dactylic hexameter and the second line is a dactylic pentameter. Each pair of lines is accompanied by an illustrating drawing in Busch's typical cartoon style. This form of verse was used in antiquity for the composition of elegies and other tragic and solemn verse, as well as love poetry that was sometimes light and cheerful. 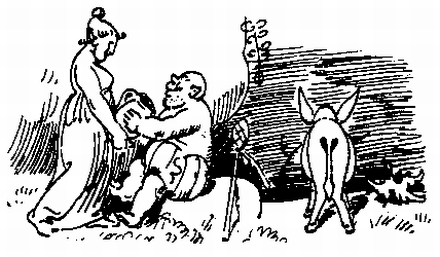 Silen has spent some pleasant time with a nymph (note: Dionysus stereotypically had nymphs in his retinue) and wine. He climbs his donkey, takes his thyrsus (note: the thyrsus was Dionysus's attribute, a giant fennel staff topped with a pine cone, a sacred instrument used at religious rituals and fetes) and rides off. He rides with some difficulty as he is very drunk. On his way, Amor hides behind a bush to play a trick on him. 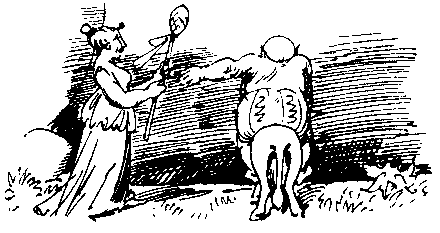 Amor shoots a dart at Silen's donkey. (Note: the word Lausbub is used here, which means rascal, scallywag, prankster. Instead of the usual bow, Busch's Amor uses a blowgun, which seems to have been a popular child's toy weapon in Busch's days.) The donkey is hit in his rear end and bucks off Silen. Silen tries to catch Amor, but fails because Amor flies off. Silen then thinks of a trick: he pretends he has gone to sleep. Amor falls for it, comes near to further tease him, and is caught. Silen punishes the captured little prankster with joy. He first spanks Amor, in the head-between-legs position, with his thyrsus. 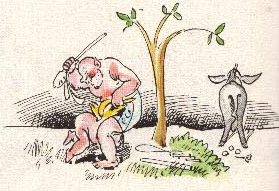 Meanwhile, the donkey relieves himself of, and onto, Amor's arrow. After the spanking, Silen displumes Amor by plucking the feathers from his wings so he can no longer fly. Silen finally rides triumphantly off on his donkey, taking Amor's blowgun, pan flute, and feathers with him. Amor, beaten and defeated, is left behind, crying. Siehe, da sitzet Silen bei der wohlgebildeten Nymphe. Gern entleert er den Krug, was er schon öfters getan. Wenn auch dieses nicht ganz ohne Beschwerde geschah. Bald mal sitzet er so, bald auch wieder mal so. Aber der Esel erhebt äußerst bedenklich das Ohr. Pustet man hinten, so fliegt vorne was Spitzes heraus. Aber der Reiter hat auch manche Geschichten nicht gern. Wenn er es aber bemerkt, flieget er meistens davon. Scheinbar schlummert der Leib, aber die Seele ist wach. Während der handliche Stab tönend die Backe berührt. Erstens scheint sie ihm schön, zweitens gebraucht er sie auch. Freilich verschiedenerlei, aber doch meistens düdellütt! This page was last edited on 10 September 2017, at 17:34.